The amateur butcher of Carlsbad Springs, Major Mark Tijssen with his sons. Landowner photo. When I first read the story that follows, in the recent Dec. Jan. Landowner magazine, my first reaction was to note many similarities to the story of the raid on Michael Schmidt’s raw milk dairy farm in November of 2006. First off, the alleged crime was victimless — no one was hurt, wronged, or got sick. Second, the style of “enforcement” seems similarly over the top. It makes you wonder — if these folks are ambassadors of the state — what kind of a state do they think we have? Third, it could easily appear that the role played by “law enforcement officers” — in both cases from the Ministry of Natural Resources — was ultimately serving would-be corporate masters who would seem to be seeking a stranglehold monopoly on our food. This Landowner magazine story is by Sarah Trant, and was originally titled “Bringing Home the Bacon”. A mainstream media news story about the same events was published in the Ottawa Citizen, and subsequently picked up by other media. Links to those stories are provided at the bottom. It’s interesting to note the differences between the Citizen story and Sarah Trant’s report report for The Landowner, reprinted below. Mark Tijssen is somebody who anybody would be proud to have as a friend and grateful to have as a neighbour. He, and countless others like him, are made of the stuff on which communities all across rural Ontario have grown, thrived and depend. A Major in the Canadian Forces, a single dad of two happy sons, a Sunday school teacher, and lynch pin of his community, Tijssen makes no bones of being proud of the rural heritage and traditions of his family. 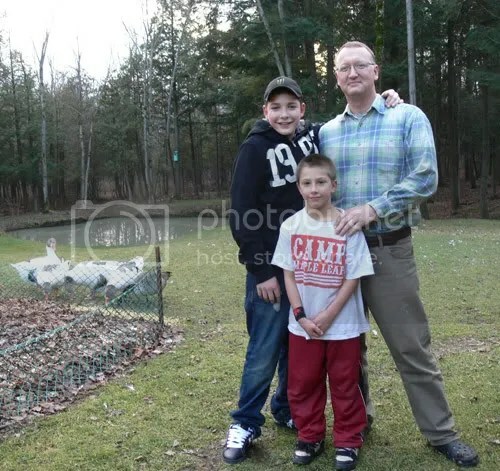 He raises geese and turkeys on his three acre Carlsbad Springs lot (a small community set in the far reaches of rural Ottawa) and, along with a group of friends and neighbours, buys pigs, beef and lambs from local farmers for their own consumption. Recently his group invested about $2500 to buy beef cattle which were subsequently slaughtered at the provincially licensed slaughter house in the neighbouring community of Russell. The carcases, stamped with the provincial seal, were then brought back to Tijssen’s three car garage to be cut and wrapped by him since he had learned the art of “butchering at my dad’s knee”. Meantime he and a friend had decided to share the cost of a pig for their own use. Tijssen duly killed and butchered the pig on his property, and his friend left with her portion of pork setting in train a series of events that no one in their right mind could have imagined. Monique, devastated, confused and shaken, not knowing what she or Tijssen could have done that was wrong, called their Minister who was at Synod in Niagara Falls who then called Tijssen who, at that point had no inkling of what had happened. Tijssen got in touch with the chief of the local MNR who he knew only to be told, curtly, that his “case was under investigation. “I was completely in the dark,” remembers Tijssen. “All I wanted to know was what was wrong. Tijssen emphasises that “all the way along I told the truth. I told that official what I’d done with the pig” – a story he was to repeat as the event began to gather momentum. Now another of Tijssen’s friends was to feel the heat. This time more officiously. Jim Barnes, just out of hospital, recovering from major surgery and far from the best of health, had driven over with a friend to borrow a table and a fridge from Tijssen. On his way from the Tijssen property Barnes was pulled over by a convoy composed of four police cruisers (an MNR vehicle was parked on the side of the road) and was told that this was a truck inspection. “The constable wanted me to lift the cab of the truck but I was too weak to do so after my surgery”, says Barnes. After a cursory inspection Barnes was handed a ticket for a minor insurance infraction. “The constable told me he had to fine me for something” says Barnes, astonishment still lingering in his voice. But this was just the beginning. Barnes was frisked roughly, told that charges were pending; meantime the truck would be searched and searched thoroughly. “I wasn’t read my rights – I was treated as if I was a criminal from the get go,” says Barnes. A considerably shaken Barnes, fearful that he could spend hours at the station being “grilled by whoever”, and feeling the effect of his recent surgery, spent no time getting in touch with his good buddy Tijssen who, in turn, contacted Ontario Landowners President Jack MacLaren. Malaren, all too familiar with the sometimes excessive force sometimes utilized by the city’s finest, advised Barnes not to venture near the station without legal counsel. Assuring the constable that he would call him right back, Barnes made some more phone calls, the first being to his wife who told him not to worry about her. “They can’t fire me,” she told him. “You go ahead and don’t worry about me.” The next was to his close neighbour who happened to be a lawyer and, in due course, the two presented themselves at the station. The following exchange amounted to very little but the attitude of the police was far from either courteous or respectful. The staff sergeant reiterating that should Barnes remain uncooperative he would have his wife fired from her position while Barnes himself could be charged. The precise nature of the charges was not specified then nor have they been since. Barnes, who remains in a fragile state of health points out that he’s never so much as ever had a speeding ticket. “I respect the law and, until now, its representatives. I still don’t know what exactly it is I’m supposed to have done. Meantime I have the impression that I could be stopped at any time, slapped into handcuffs and taken away. “It’s not a good feeling and I’m not in the best of health to deal with it. I don’t know where I’d be without my wife, my good friend Mark (Tijssen) and my neighbours. We’re all pretty tight around here. That feeling of closeness was commented on by OLA President Jack MacLaren who, accompanied by Carleton Landowners’ President Tom Black and some CLA members, arrived at Tijssen’s house when he appealed to them for advice. To some degree Tijssen had been left in blissful ignorance of what had happened. That didn’t last long. It wasn’t until after he had been subjected to what can be best described as a home invasion by a bevy of police constables accompanying MNR officials, that he got in touch with the Ontario Landowners. Tijssen was then interviewed at some lengths. “I kept on being asked about the pig until there was a quick change of gears and we got around to the beef. When I asked them what beef they were referring to they told me that it was the beef that was hanging in the garage which, the constable claimed he’d seen and of which somebody had supplied pictures. What irks Tijssen is that his three-car garage is now labelled an illegal slaughterhouse. “If the MNR guys knew their business they’d realise that this is just plain ridiculous,” says Tijssen. “There are no drains in my garage, there are permeable surfaces everywhere – not a speck of stainless steel in sight. There are no high pressure hose no drains. All essentials for any slaughtering operation. Tijssen has held nothing back from the authorities. He admits that he was unaware of current government regulations regarding the slaughter and butchering of animals. He and Barnes have cooperated fully with the authorities. Despite all of this they have been threatened and, in Tijssen’s case, his personal effects taken. Many are questioning who could have reported what was, at best, a minor infraction, to the authorities. Many wonder who, in a quiet, closely knit community, would want to cause such personal injury to “one of our own”. Meantime the last word must be Tijssen’s. Sitting in his warm kitchen with a homemade cider cake cooling on the counter, his tone ranges from exasperation to anger. “This has taken a tremendous emotional toll on me, my boys, and my friends,” he says. “It wasn’t so long ago I was there, on Remembrance Day, in the uniform of a Major in the Armed Forces paying tribute to our vets and remembering all those who had gone before and paid the ultimate sacrifice, for a better world. A world free from despots. A world free from dictators. Where honesty and trust were valued. “I wonder now whether their sacrifice was all in vain. Note how the Landowners are seen as having an impact on the political landscape in Ontario — read the first comment (by Chris) on the post linked to here about currently ongoing byelections in Leeds-Grenville and Ottawa West -Nepean. The ignoramous accusing someone else of being ignorant. I thank god there are farmers till out there allowing us to see where meat come from. Yes, meat are grown from the ground, and harvested from the meat tree. Mark did not break a law he violated a statute. Statutes only apply to government employees or if you broke the law under common law. You want your stuff back from the MNR Goons activate Criminal Code section 337 through a Notary Public and watch these bully-ies squirm. You want to have your rights recognized, then you file your claim of right as the lawful remedy is in criminal code sections, 15, 39, 126, 127 and then activate your fee schedule for ie: 10,000 in silver coin for being detained or harassed by a policy enforcement officer who works for the government corporation to extract your wealth and makes sure you get fined for competing with the big agri-monopoly corporations who by the way have lobbied, wined and dined our corrupt officials to treat us as criminals for growing our own food. Look at history, Stalin did the same thing, these very same draconian measures are being implemented throughout the USA, UK etc. If Mark Tijssen registers through the Canada Post that he is a freeman living in a common law jurisdiction and sends his fee schedule to the judge for presenting himself the flesh and blood man. A free man does not have to file a motion, and if the court quotes that that is a law, its not, its a statute and a freeman is not subject to statutes. Her Majesty herself has sworn to uphold the law of the land and these judicial pirates are trying to get you to consent to their laws of the seas, admiralty. Defacto courts do not deal in truth they deal in Admiralty law, guilty or not guilty. You have the right to convene a Common Law Court if you stand in your Free Man Jurisdiction you claim your innocence for there was no injured party and the Crown Prosecutor will not be able to to make such a party appear. In fact the Crown will not be able to prove that Ontario exists because it is but a fiction on paper, as long as you profess to be Mark of the Tijssen Family and not the fictional name they have on the court docket. Fictional court corporations can not contract with a live flesh and blood man, they will however need your legal fictional and want your consent that you represent that fiction in order to get you to be a surety for all charges that they have laid upon your name they have on record. You are not a NAME, you are a flesh and blood man, a child of God and not a statutorily defined PERSON. Be ye as wise as a serpent and peaceful as a dove. The Gestapo are coming back, you should prepare the Battle Tanks Major. They’ve been popping up everywhere from Oak Park, to Lantzville!